The bifid mandibular condyle has also been termed as Double Headed Condyle or Condylar Duplication. Bifid condyle was first reported by Hrdlicka in 1941. Since then, to the best of our knowledge, about 49 cases of bifid condyle have been reported in medical literature. We present here six cases of bifid mandibular condyle that we encountered during the span of one year. These were incidental findings on panoramic radiographs and were later confirmed with coronal computed tomographs. This article also reviews the relevant literature. The possible role of mental and psychosocial entities in oral diseases has become the subject of several studies. A study suggested that different bacterial levels were found under stress and relaxation conditions, which supports the concept that stress may contribute to dent caries and relaxation may have an anticaries effect. The relationship between increased work stress and poor oral health status was also reported. In many cases, no causative factor can be found to explain sudden episodes of tissue breakdown. Stressful life events are often presumed to be associated with disease progression, although it has been difficult to prove any causative relationship. Hence it is important to recognize patients who are in stress and to be able to advise patients about the possible effects of stress on general as well as oral health of the patient. "Theories born of bare experience and meager knowledge led to discoveries demanding and exacting martyrdom, even death, before the truth unfolded itself for us and future generations." In an era where humans are predisposed to infection easily, a lot of importance is given to food quality standards. Gutkha per say is not included in consumable items by authorities defining standards for food quality. But gutkha / pan masala is chewed frequently, which can be gauged by the fact that the Indian Market for pan masala is worth more than two hundred million rupees. This very fact, underlined the need to evaluate the hygiene status of these products. Oral Submucous Fibrosis is known and established to be precancerous. Hence, it is important to evaluate the precancerous potential of areca nut and it's products and also it's role in fibrosis. Periodontal disease is a chronic infection that slowly attacks and destroys the gums and bones supporting the teeth. In India, periodontal diseases are on a rise. The article studies the safety and efficacy of Gum Tone gel, a polyherbal formulation in patients suffering from periodontal diseases. The odontogenic keratocyst is a cyst of odontogenic origin that exhibits a keratinised epithelial lining. Odontogenic keratocyst has been the topic of numerous investigators and is known for its potentially aggressive behavior and significant rate of recurrence. This cyst often occurs as a solitary lesion in the angle of the mandible, however in some, multiple such cysts may occur in association with a syndrome called "Nevoid basal cell syndrome". Here we report a case of a bilateral odontogenic keratocyst in a 60 yr old male patient, wherein multiple cysts were present but, without any other associated manifestations. Congenital epulis of the newborn is a rare tumor of infancy. It occurs more often in female that in males and in the maxilla more than in the mandible. Various theories of its origin have been described. Here two cases of congenital epulis are presented. Case one is an unusual case of congenital epulis involving alveolar mucosa of maxilla and mandible in a girl and case two is the single congenital epulis involving alveolar mucosa of mandible in a boy is reported. Adenomatoid Odontogenic Tumour (AOT) is an uncommon odontogenic tumour which is characterized by the formation of duct like structures by the epithelial component of the lesion. Most commonly it occurs in the anterior maxilla. A case of AOT in the anterior mandible is presented with a detailed review of literature. First described by Jaffe in 1953, the Central Giant Cell Granuloma appears to be an enigmatic lesion unique to the jaws. The true nature of Central Giant Cell Granuloma remains unknown, despite considerable discussion and controversy in literature. Characteristically affecting the anterior mandibular region in women less than 30 years of age, the Central Giant Cell Granuloma exhibits a spectrum of clinical behaviour ranging from Non-Aggressive to Aggressive variants. 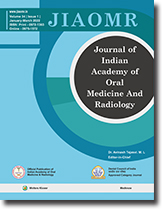 We report one such case of Aggressive Central Giant Cell Granuloma, which presented rather atypically in a male patient over 50 years of age in the posterior mandibular region.